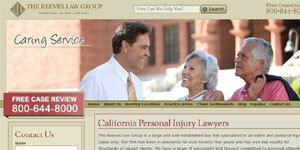 The Reeves Law Group is an accident attorney that is based out of California. We have locations throughout the state and we have esteemed lawyers that will be there to answer your call when needed. We are there to make sure your get the compensation and justice you deserve for your personal injury claim. Call us today for a free consultation.